Last Friday we made our first ever visit to Ravine Vineyards. Nestled into the little community of St-David’s I have been aware of the winery for some time but had never made the effort to visit it. Why? I have no excuse or reason as I have driven past it on many occasions. Ravine would be considered a “newer” house in the Niagara wine world and is centered around one of the most significantly ancestral homes in the entire region. This accidental winery came into being as an effort to stem an urbanization of the St-David’s area, and I for one can say that we are better off for it. If you exclude the wines themselves, Ravine produces some of the best breads in the area and the bistro offers both lunch and dinner dining that are affordable and well crafted. As for the wines themselves, the winery has 34 planted acres that are on the St-David’s bench with usual suspects planted. Being on the bench and the proclaimed hottest micro climate of the region leads to both issues in hot years and advantages in cold years (in relation to other local producers). The wine we are reviewing today is from the difficult 2008 growing year, one in which most vineyards found truly challenging. Of all the wines that were currently for sale, the one put forward to us by the staff was this Merlot. I am a little shocked as their botrytis influenced Riesling was very tasty and left good impressions on us, but I am pleased as it showed a great amount of confidence in the red wine from a rough year. With that we will jump to the tasting. We decided to decant this just before drinking, as it was a 2008 I did not think it needed much time out of bottle but I felt it deserved a chance to open slightly before we consumed. The colour was a nice bright red and the initial nose brought forth red berries and tobacco. The first few sips introduced a lighter than expected red with smooth tannins and more ripe berries. The tobacco nose remained and the wine for it’s part proved consistent from start to finish. The wine neither dazzled, sadly, nor disappointed. It’s fruit expressed itself and the oaking made it presence known. Acidity seemed perfect and the balance overall was good. It is odd that I look at this wine as being “ho hum” as there was nothing negative to say and it is a good drink now (you could cellar for 1 to 3, but no more) Merlot which is a tad on the expensive side at $34. Ravine Vineyards will definitely get another visit and I look forward to trying their upcoming releases in the years to come. 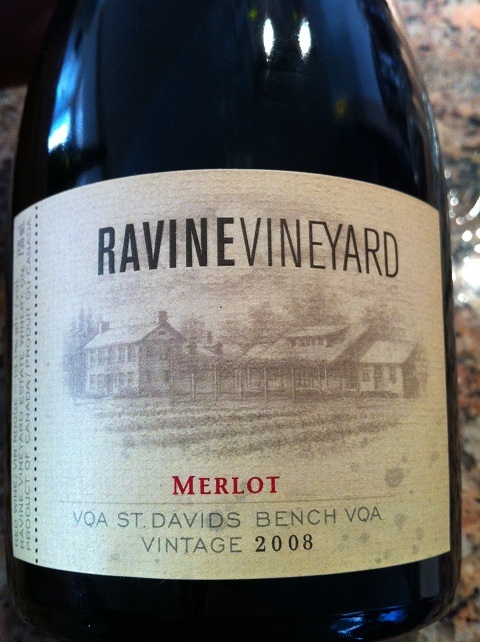 This entry was posted in Canadian, Wine and tagged canadian wine guy, ravine vineyards, wine review. Bookmark the permalink.